Premises liability refers to a type of personal injury. If you are injured or if someone you love dies as a result of someone's failure to maintain premises, you may be able to file a lawsuit in Florida to recover damages you suffered. Property owners are legally responsible for ensuring that guests and the general public are safe while on their property. When injuries occur as a result of unexpectedly dangerous conditions, owners may be liable. 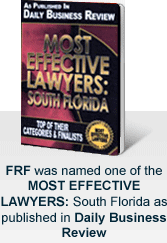 With more than 30 years of experience, dealing with premises liability and other personal injury and wrongful death cases, the attorneys at Friedman, Rodman & Frank have assisted countless people throughout Florida who were seriously injured and families of individuals who died as a result of property owners' failure to maintain safe premises. Many years of experience as Fort Lauderdale premises liability lawyers and assertive trial lawyers enable us to protect our client's rights and help them recover damages for injuries they suffered in a broad range of premises liability lawsuits. If have suffered serious injury due to the negligence of a property owner, call our office at 877-448-8585 . We are available to help you 24/7. Se Habla Español / Nou Parle© Creole.